Discussing the installation of the Kerf RUM4500 cell, P.P. 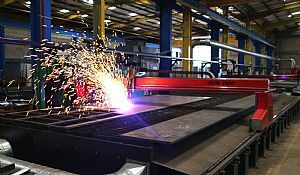 Group Managing Director, Mr Peter McCabe says: "In our previous factories we had a 9m by 4m plasma cutting machine for processing steel up to 40mm thick and a 22m by 5m flame cutting machine for materials up to 200mm thick. The machines were more than 10 years old, they were unreliable and this was compounded by poor service and support. Additionally, the machines were expensive to run, not particularly user-friendly and the machine configuration didn't suit pendulum loading. We made the business decision not to bring the machines to the new factory. We looked at replacing them with a more efficient, productive, cost-effective and user-friendly solution. Kerf Developments had exactly what we were looking for." 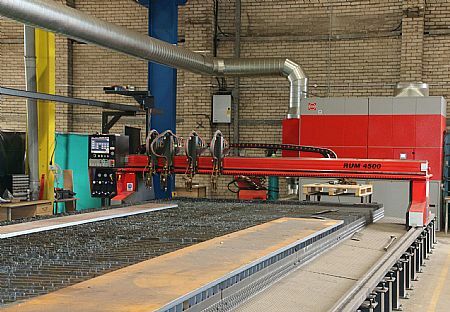 With plasma and flame cutting being central to business activities, getting the most suitable machine was critical. The bespoke production cell configuration selected by the P.P. Group was a 12m by 3.5m bed with a RUM4500p single gantry 400amp Lincoln Electric high definition plasma cutting head with Ultrasharp cut technology and a 24m by 3.5m table with two RUM4500g gantries, each with four oxy-fuel flame cutting heads – all on a single platform. This single bed configuration has streamlined workflow and improved throughput whilst the 8 oxy-fuel heads have improved productivity by more than 35%.